There is a picture taken back in 2003, where former General Harold Bedoya Pizarro (a former Commander General of the Military Forces) was on campaign for the Presidential ellections. The flag is the same flag of Colombia with the words "CDTE. FFMM", meaning Comandante Fuerzas Militares. This is a Military rank flag. 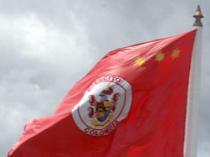 This is the flag of the Comandante del Ejército (Army Commander). it is the flag of Colombia, and the only thing that changes is the bottom inscription which reads COMANDO EJERCITO. Source: Ministry of National Defense website. During a military parade held this year in Bogotá on April 9, 2013, honoring the wounded personnel of the Colombian militay forces, I found this picture (taken from the Ministry of Defence website), where one can see the Army Commander Pennant. 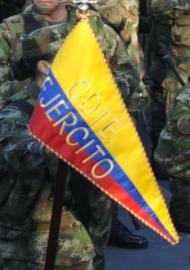 The pennant (obverse) reads CDTE (abbreviation for "Comandante", Commander) and below in same golden yellow capital letters the word EJERCITO (Army). Image is cropped from the original picture. At Album 2000 [pay00] - General Commanding Military Forces (2:3) - National flag with two black sabres in saltire in canton and with a black anchor in fly top corner. I'm not quite sure what this title would encompass - maybe a non-naval flag officer commanding joint service forces? At Album 2000 [pay00] - The note to the figure of General Commanding Military Forces explains that similar flag without anchor is used by Military Authorities. Very similar flag differing only silightly in the shape of the sabres, but probably representing just the same flag) is reported by Jaume Ollé as Military Commanders Flag. Would that be of the general level, or maybe lower, say commanders of brigades or so, no matter what rank they hold? Announced on August 6, Colombia's President Álvaro Uribe Vélez will award a fourth sun (rank insignia) for all Ensign Officers of the Colombian Military Forces, as seen in this article published by the Ministry of Defense. The actual ceremony was held in Bogotá in a rather small and private ceremony where the President awarded the batton and a certificate to allow these Officers to wear a fourth sun on their uniforms as a recognition for their services and also to act according to military protocol in most South American countries where the Commanders of the Forces (Army, Navy, Air Force, Joints Chiefs of Staff where existent) have all attained the rank of a Four-Star General (Four Suns in the Colombian case). It is worth noticing that the three sun General rank was not surpassed in respect for General Simón Bolívar whose highest rank was a Three Sun General and had the honorary title of "Libertador" (Liberator). These ranks was presented on August 7, 2009 to: General Freddy Padilla de León, Comandante General de las Fuerzas Militares (Commander General of the Military Forces), Almirante (Admiral) David René Moreno, Jefe del Estado Mayor Conjunto de las Fuerzas Militares (Military Forces Joint Chiefs of Staff), General Óscar González Peña, Comandante del Ejército Nacional (Commander of the National Army), Almirante (Admiral) Guillermo Barrera Hurtado, Comandante de la Armada Nacional de Colombia (Commander of the National Navy of Colombia), General Jorge Ballesteros Rodríguez, Comandante de la Fuerza Aérea Colombiana (Commander of the Colombian Air Force). No flag nor any other symbol has been reported for this rank, as it is a newly created one. Only the fourth sun to be added to their respective uniforms. Today on Colombian TV news CM& the current Commander of the Military Forces is shown in an interview. In the background a pennant is seen, similar to the General Commanding a Unit, but with three suns. The above described Pennant shows a three-sun General. There's a variant for the General flag in Colombia's Army. It is the Army flag (variant) plus three suns (as the rank insignia) on the top right. This picture shows in the background the Pennant for a Four-sun General (in Colombia Generals wear Suns instead of Stars). The Pennant is similar to the "General Commanding a Unit - Pennant", but they do differ however because in this case the Four-sun Rank Pennant is shown with the respective four suns in the obverse and not in the reverse as a Unit Pennant. For a full comprehensive and detailed military rank chart and insignia plese see this Wikipedia article. This is the Army Rank flag for a Major General. The Generals in Colombia wear a Sun as their shoulder strap inignia. The ranks for Mayor General (Major General) is 2 Suns. This is the Army Rank flag for a Brigadier General. The Generals in Colombia wear a Sun as their shoulder strap inignia. The ranks for Brigadier General is one Sun. During the F-Air 2008 event, an airshow in Rionegro, I had the chance to take some pictures on flags and ask for detailed info as well. I found out that the Army Division Penants are actually rank flags. The rank flag consists of a tricolor pennant. On the obverse one can see the abbreviation of the Unit and on the reverse of the pennant is a sun, representing the rank of General. These pennants are only for Generals. This is the rank flag for an Army Major, commanding officer of the Batallón Colombia. The rank flag keeps the same pattern as the Battalion's Pennant, only displaying the rank on the obverse of the Pennant. Source: Colombian Army official website, Joyería Granados (Granados Jewelry) a Colombian insginia and decorations manufacturer. The star is outlined in red and there is a little white fringe between the star's border and the red vertical stripes. There was an unfortunate incident recently where a Colombian soldier was killed as part of the BICOL. The news were reported at official Army communiqué, official Military Forces communiqué and RCN TV news channel. During the news report on RCN, I saw another Army rank flag. It is of Captain - Commanding Officer at Batallón Colombia. The obverse of the flag is the same ratio and color scheme as the Major - Commanding Officer of the Batallón Colombia. The only thing that changes is the rank, in this case rank of captain (three horizontal stars. On the reverse of the pennant one can see in bold capital white letters: on top it reads BICOL and on the botom NO. 3, both equally set across the pennant. This is probably commanding officers of subunit of the Battalion, most likely a company (100-200 soldiers aprox.). Based on <www.fuerzasmilitares.org> (Picture taken on July 20, 2005). This is most likely a rank penant of an Infantry Major commanding a Military Unit (most likely a Company). Based on <www.fuerzasmilitares.org> (Picture taken on July 20, 2005). This is most likely a rank penant of an Infantry Captain commanding a Military Unit (most likely a Platoon).